The last phase of Mark Twain's life is sadly familiar: Crippled by losses and tragedies, America's greatest humorist sank into a deep and bitter depression. It is also wrong. This book recovers Twain's final years as they really were—lived in the shadow of deception and prejudice, but also in the light of the author's unflagging energy and enthusiasm. 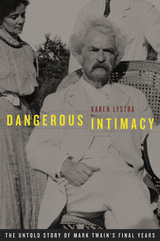 Dangerous Intimacy relates the story of how, shortly after his wife's death in 1904, Twain basked in the attentions of Isabel Lyon, his flirtatious—and calculating—secretary. Lyon desperately wanted to marry her boss, who was almost thirty years her senior. She managed to exile Twain's youngest daughter, Jean, who had epilepsy. With the help of Twain's assistant, Ralph Ashcroft, who fraudulently acquired power of attorney over the author's finances, Lyon nearly succeeded in assuming complete control over Twain's life and estate. Fortunately, Twain recognized the plot being woven around him just in time. So rife with twists and turns as to defy belief, the story nonetheless comes to undeniable, vibrant life in the letters and diaries of those who witnessed it firsthand: Katy the housekeeper, Jean, Lyon, and others whose own distinctive, perceptive, often amusing voices take us straight into the heart of the Clemens household. Just as Twain extricated himself from the lies, prejudice, and self-delusion that almost turned him into an American Lear, so Karen Lystra liberates the author's last decade from a century of popular misunderstanding. In this gripping book we at last see how, late in life, this American icon discovered a deep kinship with his youngest child and continued to explore the precarious balance of love and pain that is one of the trademarks of his work. Karen Lystra is Professor of American Studies at California State University at Fullerton. She is the author of Searching the Heart: Women, Men, and Romantic Love in Nineteenth-Century America (1989).